Way back in 1907, Charles B. Leonard founded Philadelphia Tramrail Company, a manufacturer of monorails and meat track systems. Soon after, Robert Riethmiller was hired as a mechanic’s helper. Over the next two decades, Robert learned the ins and outs of running the business and in 1929, he purchased it. A few years later, his son, Robert J. Riethmiller Sr. joined the company, and years later his son, Robert J. Riethmiller Jr., came aboard, as well. Fast forward to 1994, and the next generation furthered the family legacy, when Eric Riethmiller joined the ranks. Eric, along side now-CEO Mike Savage, helped rapidly grow and expand PTR Baler and Compactor Company to the international industry leader that it is today. Since 1907, many things have changed. One thing, however, hasn’t- our dedication to creating the highest quality, safest waste equipment on the market. Just like we care about the safety of our own family, staff and technicians, we care about the safety of you and your employees. We’ve been doing it longer than just about anyone, so we know how to do it right. A major aspect of the PTR difference is that we work with you before, during and after the sale to ensure our products are being used safely and optimally. We want to ensure you fully realize the benefits of utilizing our balers, compactors and other waste products. Our equipment is key to helping your company reach it’s sustainability goals, increase workplace productivity, efficiency and of course, safety. 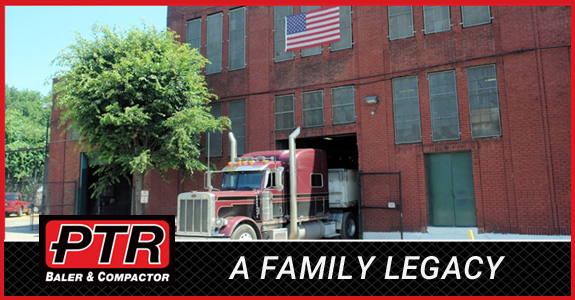 PTR is now celebrating 50 years of baler manufacturing and over 100 years of American steel manufacturing. We’re proud to have a family legacy that has stood the test of time. Here’s to another 100 years!